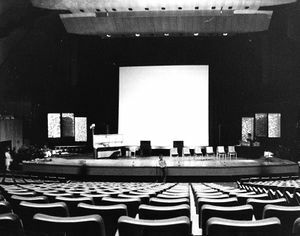 I.E.E.100 is a seven-minute piece specially composed by Delia for the Radiophonic Workshop in Concert event on the 19th May 1971 at the Royal Festival Hall to celebrate the 100th anniversary of the Institute of Electrical Engineers. I began by interpreting the actual letters, I.E.E. one hundred, in two different ways. The first one in a morse code version using the morse for I.E.E.100. This I found extremely dull, rhythmically, and so I decided to use the full stops in between the I and the two E's because full stop has a nice sound to it: it goes di-dah di-dah di-dah. I wanted to have, as well as a rhythmic motive, to have musical motive running throughout the whole piece and so I interpreted the letters again into musical terms. 'I' becomes B, the 'E' remains and 100 I've used in the roman form of C."
Delia's ability to take on enormous projects to order was [shown] when she composed a special extended electronic piece for the Institute of Electrical Engineers which was performed before the Queen and Prince Philip at the Royal Festival Hall. Taking the initial letters IEE, Delia composed music from their mathematical correspondences and from morse code: introducing elements of the development of electricity in communication from the earliest telephone to the Americans landing on the moon. There was the voice of Mr Gladstone congratulating Mr Edison on inventing the phonograph: the opening and closing down of Savoy Hill with Lord Reith's voice: and Neil Armstrong speaking as he stepped onto the surface of the moon. The powerful punch of Delia's rocket take-off threatened the very fabric of the Festival Hall. In some ways the seven-minute piece resembles much of Derbyshire's earlier works, particularly in the use of complex, drawn-out tape pedal points, in this case, layering on to of these excerpts of famous events in scientific and broadcasting history, such as the Apollo moon landing and the opening and closing of the BBC's Savoy Hill studios. DD125131: Notes: "General: Analyse I E E 100 in as many ways as possible: morse code, vowel analyis"
DD125233: Historical events for sections 1 to 6: 1871 morse code, 1877 early telephone, early radio, countdown to liftoff of Apollo 11. DD150238: "Reel 1: 30's Marconi bleeps / 40s "Title music" / Elect. Storm / Telstar tune / Early bird" ... "Walking on moon music"
Performed at the Royal Festival Hall in presence of HRH Queen Elizabeth II on Wednesday 19th May 1971. On Attic Tape DD260: "IEE 100 Peter Z"
In the BBC Sound Archive on tape TRW 7397: "I.E.E. 100 (Institute of Electrical Engineers Centenary)": "Reel 5 is a stereo recording of the final presentation." Two short excerpts were broadcast during the Sculptress of Sound documentary on BBC Radio. Excerpts can be heard in the background of the Wee Have Also Sound Houses radio documentary. ↑ Louis Niebur, Special Sound, pp. 134-135. ↑ 6.0 6.1 The Tape Library List's entry for TRW 7397. This page was last modified on 12 May 2017, at 15:04.